This morning we rose at 07:00 and quickly had breakfast and packed our bags. As nice as Mittenwald was, it was probably our poorest hotel experience, with the smoky room, grumpy service from the old woman who appeared to own the place, and uninspiring breakfast, topped off by the grumpy woman only bringing out a basket of good bread rolls for a group of women who arrived at breakfast after us and then with whom she shared some apparently hilarious anecdotes, because they laughed uproariously while we were finishing our breakfast. She was probably telling them we were weird - we'd asked for a non-smoking room! We left and carried our bags to the station, about a third of the distance we'd originally walked with them in the other direction. 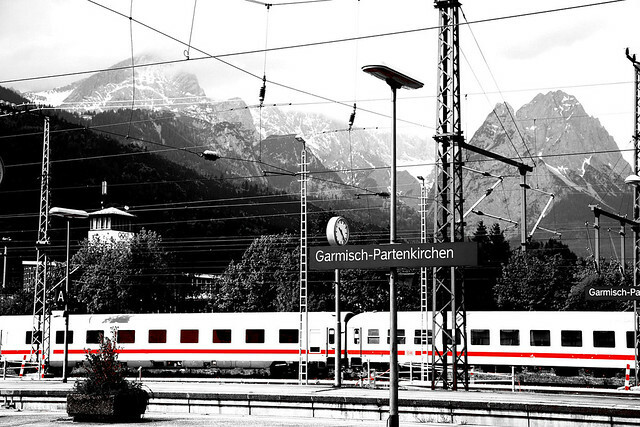 We bought tickets to Garmisch-Partenkirchen from the machine, which demanded €7. I tried paying with a €20 note to get some smaller change back, but was foiled by the machine not accepting notes higher than €10. Luckily we had €7 in coins, but this achieved the exact opposite effect of running us out of small change! The train left at 09:36, according to the timetable, but had a cryptic inscription regarding what platform it left from, which I interpreted from the German abbreviations to mean platform 1 on weekdays, excluding Saturdays, platform 2 on Saturdays, and platform 3 on Sundays and public holidays. Being a Thursday, I assumed we should wait on platform 1. The only scary factor was that platforms 2 and 3 lay across two lines of track, accessed by walking across the tracks down shallow ramps, and if another train pulled in to 1 we would be blocked from reaching 2 and 3, and there were two trains arriving just before ours left. As we waited, a small crowd built up and everyone waited on platform 1, which we took as a good sign. But then I saw a man and a woman check the timetable and he clearly said (in German) "Platform 3" and pointed over there, and then they walked out to the street. Then a train pulled in from the Munich direction to platform 3. A few people walked over there, but none got on. Then someone asked the guard something, and they all returned to platform 1, so we breathed a sigh of relief and stayed put. A few minutes later our train arrived from Innsbruck. Everyone piled on and it left soon thereafter, letting us wave goodbye to Mittenwald. Twenty minutes later the train pulled into Garmisch-Partenkirchen again, giving us a good view of what was presumably the Olympic ski jump ramp. We alighted and walked out into the street to see if we could spot an obvious bus stop for our bus to Schwangau. Not spying any, I inquired in the DB office, despite a big nasty sign outside saying the tourist information office was 10 minutes walk down the street - obviously they were fed up with clueless tourists like us asking them for information. Luckily though, my request was easy, and in German, so the guy told me cheerfully that it was just outside, to the right of the taxi stand. So informed, we proceeded to purchase provisions for lunch from a bakery in the station, getting an assortment of four bread rolls by the "point and say 'eins'" method, as well as an apfelschorle for Michelle to drink. Thus provisioned, we headed out to the bus stop, pausing to take a photo of a bright yellow fibreglass cow painted with coloured hearts that was grazing peacefully on the footpath. Two girls and a guy were sitting amidst a group of backpacks by our bus stop, and from overheard conversation it was clear they were American. With 20 minutes or so until our bus, I asked them if they were going to Oberammergau - where I knew from our bus timetable that we had to change buses. They said they were going to the castles near Füssen actually, and I said that was where we were going too, but there was a bus change at Oberammergau. This seemed to be more than they knew, so it turned out my fishing for information that we were in the right place was actually providing news to them! The girls were from Tennessee and the guy was actually from Mexico. One said to me that they'd begun their trip in Köln, and they'd climbed the cathedral tower and she swore she'd seen enough spiral staircase to last a lifetime. They hadn't liked Munich much for some reason, and now they were here in Garmisch because one of the girls' dad had been to Germany 20 years ago and had told them, "You have to see the castles," and said they were "right near" Garmisch, at which point the other interjected and said, "Your dad didn't know what he was talking about!" Our bus arrived and we all piled on for the 40 minute ride to Oberammergau. We passed through some gorgeous countryside, with gentle rolling hills covered in meadowy grass and scattered flowers, dotted with wooden hay-sheds, giving way to steeper hills covered with trees, and behind them soaring peaks of rock striated with snow. The bus took us up a steep winding climb up the mountainside to a high valley which was apparently Ammergau, where the towns of both Oberammergau and Unterammergau were. We didn't absorb much of Oberammergau, except that there were a lot of large crucifixes attached to houses, erected on freestanding poles, and scenes of crucifixion and other biblical scenes painted on to the exteriors of houses and other buildings. As the site of the famous once-a-decade Passion Play, I suppose it was to be expected. 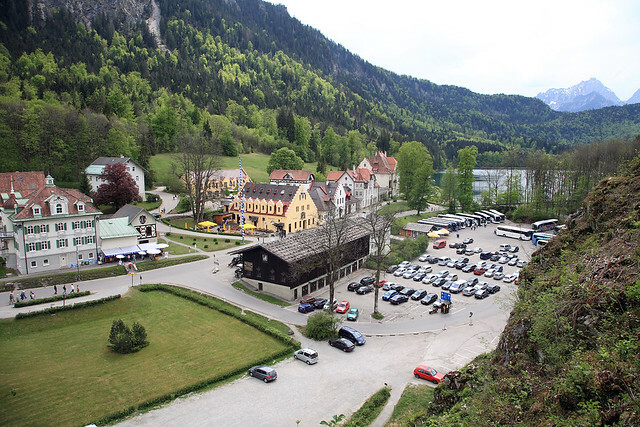 On changing buses, I expected our next bus would go all the way to Füssen and we would have to pick the right stop out of five listed stops in Schwangau to get close to our hotel. So I asked in halting German of our bus driver if he knew which stop would be near Hotel Weinbauer. He replied in German - several times until I understood it - that he didn't actually go all the way to Schwangau, and that we had to change buses two more times to get there! I told the girls and guy travelling with us the news and they expressed surprise, but took it in stride. It seemed their entire trip had been run on a day-by-day basis and they were used to not really knowing what they were doing next. The second bus took us through more pastoral countryside and tiny villages to a stop by a bridge over a deep, forested gorge. There we transferred to another waiting bus to continue our journey. This one took us to a stop by a large fire station, where yet another bus took over for the final stage of our one-train-and-four-buses trip. Again I asked the new driver if he knew which stop in Schwangau would be near our hotel and he implied (I think) that there was only one stop in Schwangau, so that was the one we wanted. While looking at the bus route map on the wall of the bus, one of the girls came over to have a look too. I pointed out where we were, where we were headed to Schwangau, where they said they were going to Füssen, and where the castles were, slightly off the route to one side near Schwangau. 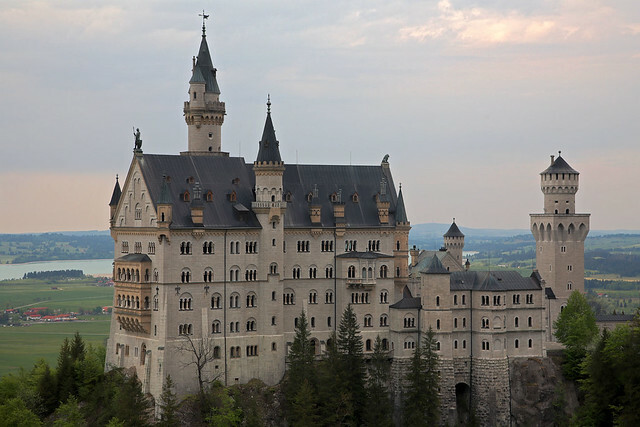 She said, "Oh, so there's no point us going all the way to Füssen. We'd just have to go back to get to the castles." When I agreed I thought that was the case, she said that they may as well get off where we get off and make their way from there. I said I thought it was about a half hour walk from Schwangau to the castles, or possibly there was another bus to catch, and she replied that half an hour was nothing, as long as they knew where they were walking. So when we finally rolled up to Schwangau and saw our hotel right across the road from the bus stop, at 12:46 after over three hours of travelling, they alighted with us. 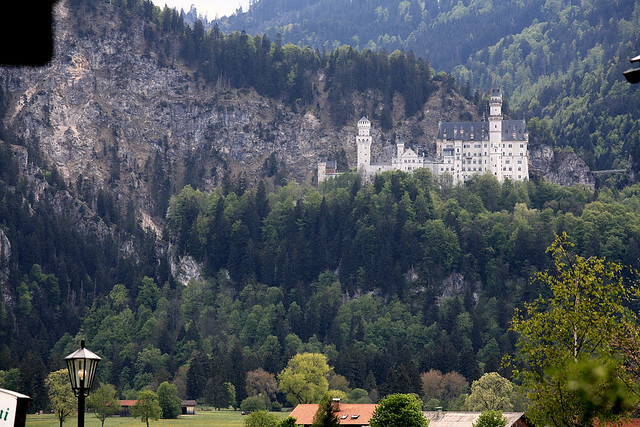 We could see Schloss Neuschwanstein in the distance, perched picturesquely partway up a steeply sloped mountainside. It looked to be a good hour's walk away to me. The others were a bit mystified as to what to do, but I noticed a tourist information office across the street and down just a couple of buildings from our hotel, so pointed them to it. They departed cheerfully as we turned the other way to check in at Hotel Weinbauer. The friendly lady at reception gave us a choice of a room on the ground floor with a balcony and view of the castle, or one upstairs, larger, but with no balcony. We chose the balcony room and were pleasantly surprised to find I'd interpreted her German correctly and we did indeed have a view of Neuschwanstein sitting prettily in the distance across a large flat meadow behind the hotel. The woman had said we had time to head up to the castles right away, as she gave us a hotel guest discount card. When I suggested the tours might be sold out already for the day, she scoffed lightly and said it wasn't that busy at this time of year. So we dumped our bags quickly and headed back out to the tourist information place, only to find it closed from 12:30 to 13:30. 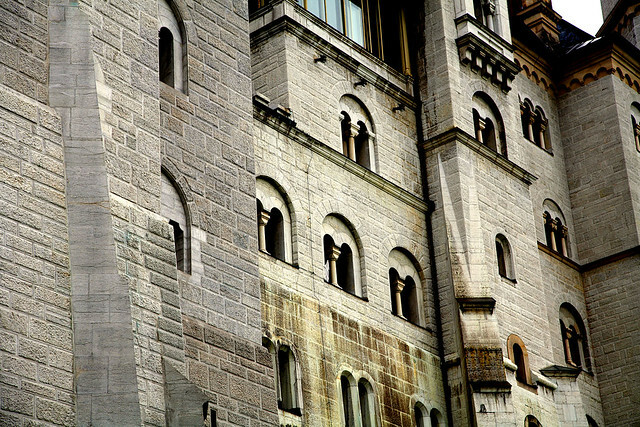 So we asked the driver of a passing bus that pulled up in front how we could get to Neuschwanstein, and he indicated the stop across the road where we'd originally got off, and said the bus would be there in ten minutes. We crossed and waited, and the bus arrived as promised. Tickets to the castle were €1.30 each. The bus turned down a narrow country lane lined with trees and headed across the valley plain towards the castle. Michelle saw the girls we'd travelled on the bus with, sans Mexican guy, walking from some hiding place to the tourist office, which was just about to open again. When the bus reached the foot of the hills and I expected it to start climbing up to the castle perched loftily above, the driver said that was it and told us to get out. Slightly mystified, we blundered out into a tourist mecca of obscene proportions, with a tiny street lined with hotels, restaurants, fast food places, souvenir stands, all crawling with Americans, Japanese, all manner of other tourists, and even the odd few Germans. Wandering amidst the wonderland like stunned rabbits, we discovered a huge, modern ticket sales building with long queueing corrals hawking guided tour tickets for the castles. Apparently this was the central administrative spot for tours and access to the castles up the hill from here was either by walking or paying what was no doubt an exorbitant price for a slow horse-drawn carriage ride that looked no faster than human footwork. Luckily there were no queues for tickets and I acquired these precious items with no difficulty, getting us on to guided tours presented in English at 14:45 for Hohenschwangau and 16:45 for Neuschwanstein. As I left the ticket office, I noticed the Mexican guy running in to buy tickets for himself, sans the two girls. He had presumably walked here by himself immediately after our arrival in Schwangau, leaving the girls behind. We figured they had not actually been travelling together, but had merely met up and been going the same way for a while. With some time to kill before our first tour, we wandered up the gleaming promised land of tourist traps, finding an enormous parking lot full of dozens of touring coaches. Beyond that was a gleaming jewel, a light at the end of the tunnel, a glittering turquoise blue-green lake sitting in front of towering tree-lined slopes and snowy Alps beyond. The Alpsee was a sight for sore eyes, a natural curative for the excesses of commercialism behind our backs, as we simply stood on the shore and soaked in the natural beauty. 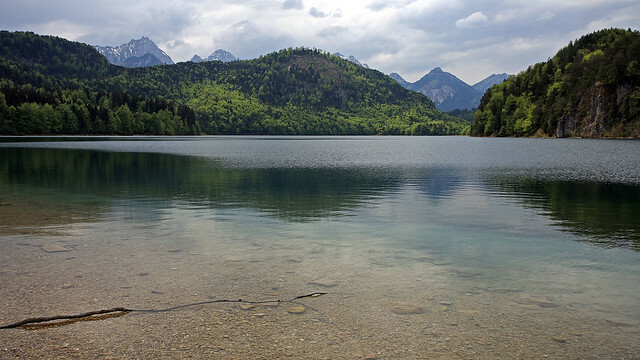 It was immediately obvious why the royal family of Bavaria chose to build their country retreats here, with views of this marvellous Alpine lake. 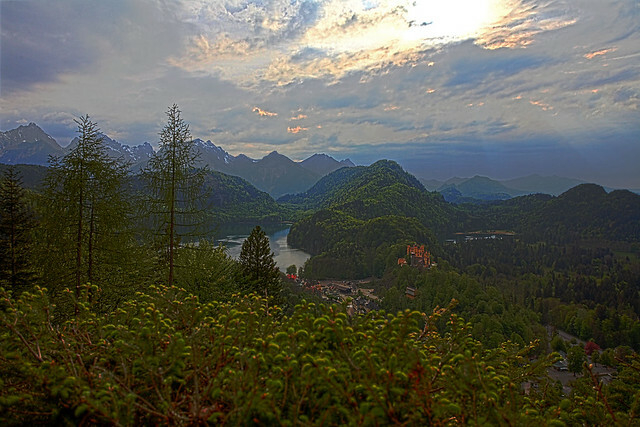 Rejuvenated, we braved the tourist crowds once more to take the 400 metre walk up the hillside by the lake to the entrance of Schloss Hohenschwangau, the castle that "mad" King Ludwig II had been born in. It was a rough and ready affair, painted an odd choice of yellow-orange, and about half clad in scaffolding and hessian as numerous workers crawled all over it like ants, presumably undertaking some restoration work. 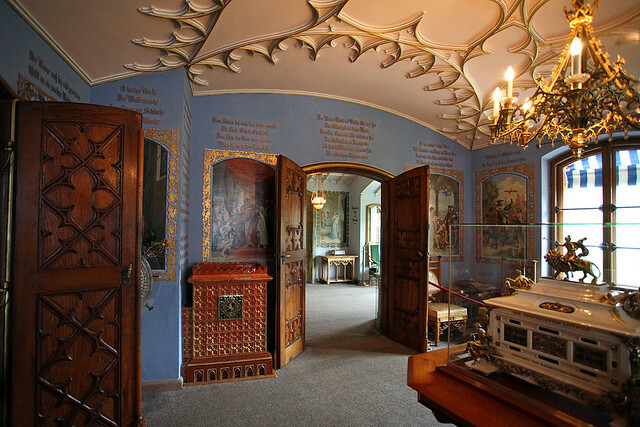 The waiting area for the guided tours of the interior comprised a number of connected courtyards outside the building, with various splendid views out over the Schwangau valley below or the Alpsee out the other side. A swan fountain of blackened bronze spurted water gently while a larger fountain consisting of four lions supporting an ornamented basin was not operating. Eventually our tour number appeared on the electronic signboard at the entrance and we joined a number of other people for the English language tour. The guide was a jovial older gentleman with rounded face, small glasses, and a goatee beard, who spoke English well but with a slight German accent, and kept cracking jokes amidst his very informative commentary. 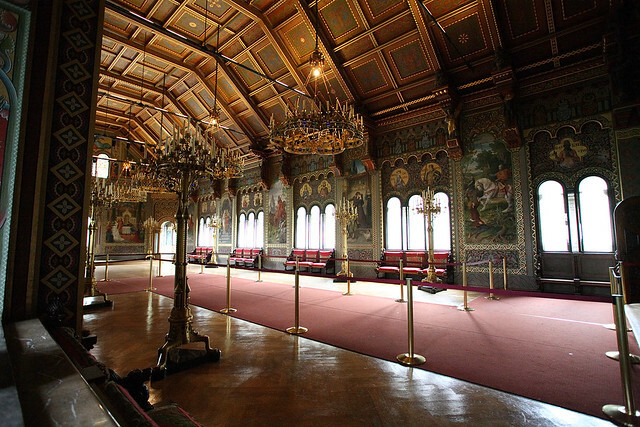 The tour took us through several elaborately decorated rooms, beginning with the Queen's chamber on the first floor. The guide noted the King had a separate bedroom on the floor above, but it was okay because there was a "hanky panky" door hidden behind a mirror in the Queen's bedroom, that led upstairs to the King's. He said this was quite a modern thing, because in earlier times the King and Queen would actually have lived in separate buildings. We went up to the King's chamber upstairs, which included an amazing bedroom, painted with a pastoral outdoor scene and decorated with stars on the ceiling which were actually glass and could be illuminated by oil lamps from the third floor above, as well as a circular window that could be shuttered by a moving brass circle to simulate phases of the moon. The guide pointed out the upper "hanky panky door" and an adjoining door to a bathroom. He mentioned that this was not all that old, as castles go, being occupied in the mid-19th century, during the Industrial Revolution, so they had things like running water, plumbing, and had even had the palace fitted with electric lights. 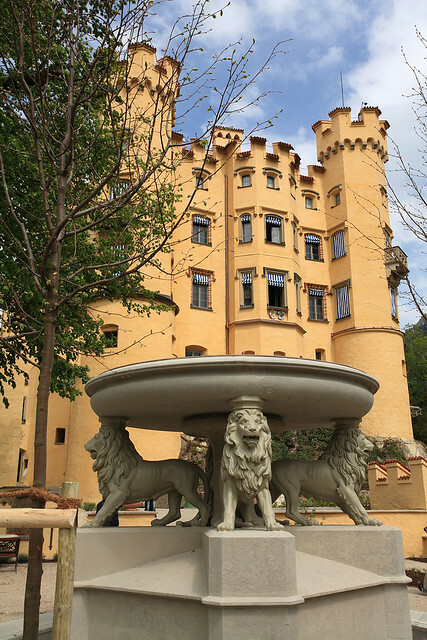 We left the marvels of the well-lived-in Hohenschwangau and took a brief break to browse souvenir stores and grab a bratwurst for me and an apple drink for Michelle, before tackling the imposing uphill walk to Schloss Neuschwanstein, perched high above. The walk was steep and somewhat tiring, but we managed it okay, the greatest hazard being the continual deposits of horse droppings littering the road. As we approached the castle, the trees parted magically to afford our first real close-up view of this fairy tale place, with gleaming white stone walls leading up to a towering spire and battlement-inspired but somehow gentler decorative architectural features. It had started sprinkling when we'd left Hohenschwangau, and the rain grew a bit heavier, but never enough to require an umbrella, although I did have to put my camera in my backpack to avoid too much water on it. Once at the castle, we sheltered briefly in the gatehouse, before the urge to explore overcame the sprinkling raindrops, and I wandered about in the courtyards: a lower one and a higher one connected by a broad flight of stone steps that turned 90 degrees, on the left side as you looked from the gate. From the upper courtyard there was a fine view of a truly impressive metal dragon waterspout, as well as more stone steps leading up to a metal-ornamented wooden door into the schloss. Many people were milling around waiting for their tours and taking photographs. After a while, our tour number appeared on the signboard and we piled through the turnstiles with about thirty other people. A sign indicated the tour began on the second floor, and pointed us up a seemingly endless spiral stone staircase, from which we emerged into a long corridor set up with queueing cordons and terminated by a chunky iron gate, which was locked. We waited a few moments, admiring the view out the windows to our left down into the upper courtyard below. Eventually a woman appeared to unlock the gate and let us in, from where we entered a magical fantasy realm decorated lavishly with ornate hand-made furniture, gold and silver fripperies, and amazing painted wall frescoes. 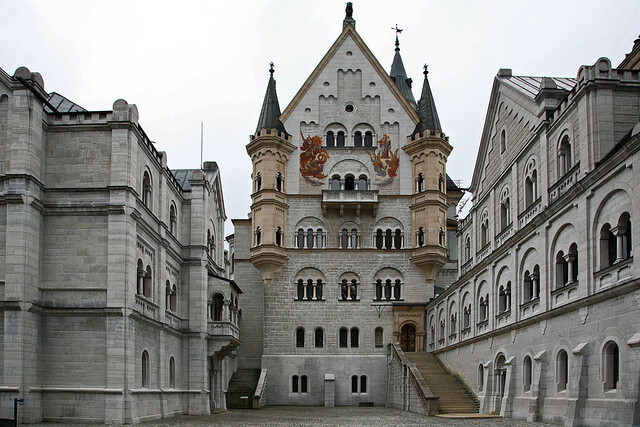 Highlights included Ludwig II's bed, crowned with a model cathedral covering the entire canopy area over the bed; an artificial grotto made to look like the inside of a cave and illuminated by variously coloured lights; the music hall, a spectacular Wagnerian inspired feasting hall-like design straight out of Germanic mythology; a full wall fresco of Lohengrin on a swan boat meeting his wife (the guide woman summarised the story of Lohengrin as follows: "Lohengrin meets this woman and marries her on condition she never asks what his name means. One day she does, and he disappears. That's not the whole story, there's a bit more to it than that." One might hope so, because that's some stretch to fill a four hour opera with just that! 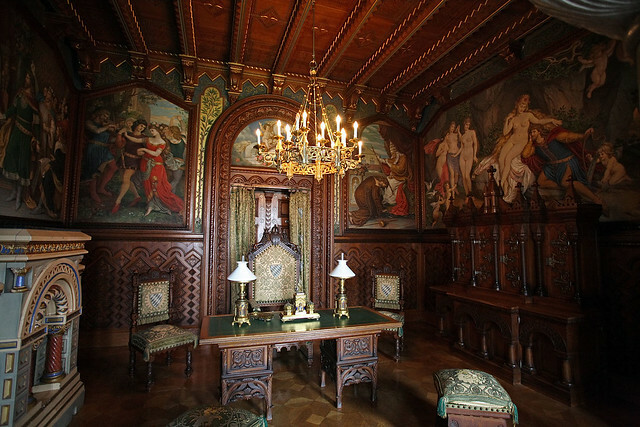 ); and several other rooms of stunning variety and decoration that really defy description easily. The guide kept telling people not to take videos or photos, but everyone kept doing so. Once the tour was over, we were left to descend yet another spiral staircase (I thought of those girls we'd met who said they'd had more than enough of them to last a lifetime already) to an entrapping-style gift shop that you had to walk through to reach the exit - which was down still further flights of stairs and along a 50 metre or so long tunnel apparently bored through the rocky foundations of the castle. At one point there were toilets there for the relief of people trying to find the exit and being trapped inside, near which was a gaping doorway tens of metres above the ground far below, sealed off for safety by only an iron gate. We also had to pass through the kitchen of the castle, and then along another long passage, past a scale model of the castle. Eventually we emerged, blinking, into the bright cloudy daylight. The rain had stopped so we decided to take the 20 minute walk up the hill to the Marienbrücke, a small footbridge over a deep gorge overlooking Neuschwanstein. The walk was very steep and taxing, but thankfully not too long, and gave us the best view yet of the castle, perched on its peak, but below us on the bridge, and set against the backdrop of the plain below, which spread out like a tablecloth decorated with tiny villages and little lakes. 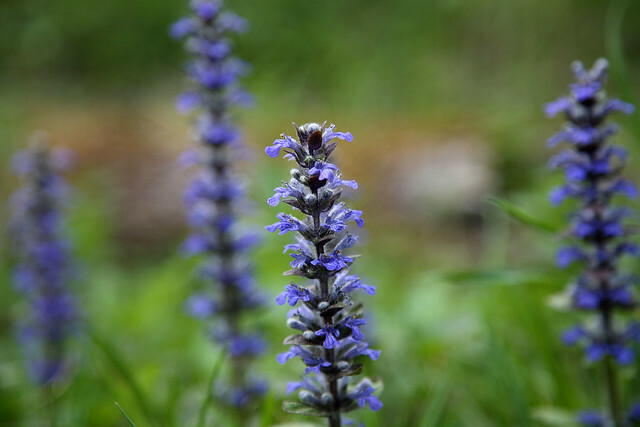 I took time to take several photos, including trying both wide and tele extenders on my Lensbaby. Then we began our long descent back down to Schwangau and our hotel. We were walking down the long steep path back to the tourist megaplex at the foot of the hill when a man came up behind us and asked if we spoke English, then asked if we'd caught the bus out here. I replied yes, but was about to tell him we planned to walk back to Schwangau, as I wasn't sure what he wanted, when he asked if we knew where the bus stop was. I replied, "At the bottom of the hill, about ten minutes walk." He said he'd left his wife there to wait for him, thanked us, and took off like a bolt of lightning down the hill. Ten minutes later, we reached the end of the path, dodged the chain of restaurants and hotels, and headed off down the road back to Schwangau. After walking about five minutes we realised the lovely forested scenery we were winding through, although beautiful, in no way resembled the straight tree-lined avenue through open fields that the bus had taken to go from Schwangau to Hohenschwangau. A pair of joggers approached and I stopped them to ask if we were on the road to Schwangau, or just to Füssen. The woman didn't know, but pulled out a gadget with a GPS map on it, pinpointed our location relative to the castles, the towns, and the roads, and indicated that we were on the wrong road, and that the quickest way to Schwangau was to go back to the bus stop near the castles and take the correct road. We did so; thankfully it wasn't too far to backtrack. Then we walked along the straight laneway through the fields the 1.5 kilometres back to our hotel. We made it by 20:00, but Michelle reminded us that the restaurants here all closed at 21:00, so we went straight into the Pizzeria San Marco, across the road from our hotel. Michelle ordered a spinaci pizza and I got rigatoni amatriciana, which was fine, except that it had fatty German bacon in big chunks rather than thinly sliced Italian style. The waitress seemed to be speaking half-German, half-English, and half-Italian, and the menu (she gave us an English version as soon as she heard Michelle say something) said that the desserts were made fresh daily, so ask what they are, and "ask in Italian!" So as we ate, I tried to reconstruct what Italian I could remember through the German roadblocks filling my head. The best I could come up with was, "Abbiamo una vista di dolce del giorno." Not brilliant, but it should get the message across. So when the waitress (who had bright burgundy red dyed hair, by the way) cleared our plates, I said it was the best Italian I could come up with on the spot and delivered my line as best I could. She smiled and turned to go, dropped our plates off, then sat down and started chatting with another customer! It was at this point that we realised she probably didn't speak Italian at all except for a few stock phrases like "grazie" and "buongiorno". She probably assumed we were complimenting the meal and just nodded and smiled at us. After waiting a good five minutes, I resorted to asking for "die nachspiesenkarte", which she brought immediately, and said there was also freshly made tiramisu and pannacotta available. I settled on an "ice dessert san marco", which was scoops of vanilla and chocolate ice cream laid out with some mini rum babas and a large strawberry, the lot smothered in rum, while Michelle had a cappuccino, made properly by a milk steamer and coffee dripper. We got out a bit after 21:00, although the place showed no real signs of closing. 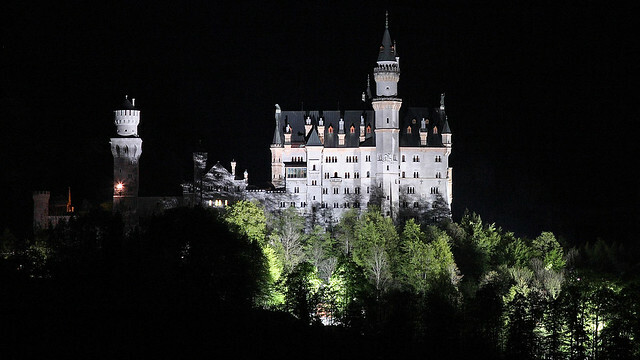 We returned to our hotel and then went outside again briefly to take some long exposures of Schloss Neuschwanstein in the distance using a tripod. Unfortunately, 200mm of focal length wasn't enough to do it justice from that distance. Last updated: Monday, 25 January, 2016; 01:11:55 PST.